Archaeology is the enemy of deception; a threat to those who would rewrite history. The Bible is also the enemy of deception; overflowing with, what is for many, inconvenient truth. "The words of the Lord are pure words: as silver tried in a furnace of earth, purified seven times. Thou shalt keep them O Lord, thou shalt preserve them from this generation for ever" (Psalm 12: 6-7). 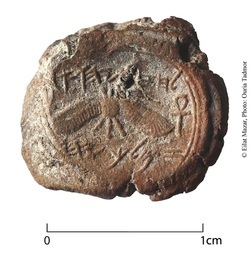 The Prophet Isiah's seal impression found in Jerusalem (see II Chronicles 29:1-2; 32:20; II Kings 19:6, 20; 20:1-11). "All scripture is given by inspiration of God..." (II Timothy 3:16). “As we assess the situation at the beginning of the twenty-first century, we recognize that archaeologists of the lands of the Bible and biblical scholars have long since departed from a common path of shared goals. …Field archaeologists by necessity concentrate more on anthropological and archaeological theory or material culture studies than on the literary history of the Bible. Likewise, biblical scholars today tend to focus their research within the subfields of theology, biblical history, philology, form criticism, literary analysis, and comparative religions; they have little time to work in any depth in areas closely related to their specialty and at best only “dabble” in archaeology. Many biblical scholars seem to think that participation in a few field excavations is enough to make one a proficient archaeologist, while many field archaeologists believe that knowledge of Hebrew is enough to master the biblical texts or to reconstruct a history of the biblical world. In reality, however, both disciplines require years of intensive study to attain a fluency of the languages of material culture or the related subspecialties of biblical studies. The result is that archaeologists and biblical scholars spend less and less time communicating with each other, which fosters the perception that the related fields of material culture and text have very little to contribute to each other. Even when the conversations take place, the two groups often find themselves speaking different languages” (Andrew G. Vaughn and Ann Killebrew, Jerusalem In Bible And Archaeology, 2003, p. 1-3). "We propose to reverse the usual scientific procedure in Biblical Archaeology. The research agenda should be archaeological/anthropological, relying on patterns identified in the archaeological record. Explanation of these patterns, however, should include all lines of evidence, with an important place reserved for the biblical texts. From a cultural perspective, the Bible as an ‘unconscious revelation’ is invaluable." (2010, S. Bunimovitz and A. Faust).